I have always had a thing for black dogs and cats. Black, black, black. My first three dogs were black and I had a black cat. Three out of four had some white on them, but overall they were black. So how in the world did I get 5 light colored dogs? That darn Brut. 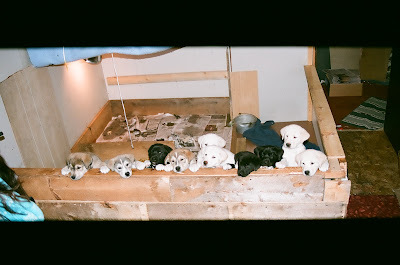 When my black and white Husky pick was already chosen, the breeder held up Brut, the heavens sang and blah, blah, blah, my whole world changed. 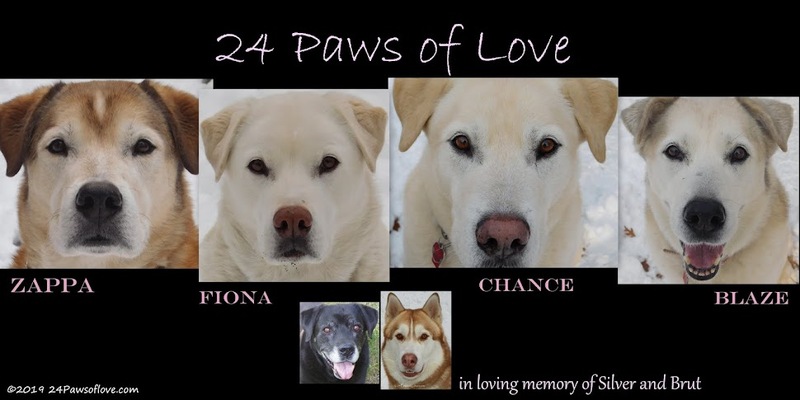 When Silver and Brut had ten puppies, four white, three black with white chest and paws and three Husky looking ones colored from sable to grey, again my world was turned upside down. Four WHITE puppies?? 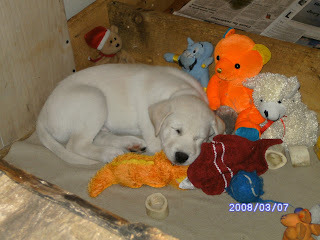 I remember the look of horror and surprise that passed between my husband and I, who was going to want WHITE puppies?? It still blows my mind that they were the first to go. Nope! No black dogs here!! Zappa was a given. He could have been purple with yellow polka dots and we were keeping him and of course I had my heart set on one of the black females. 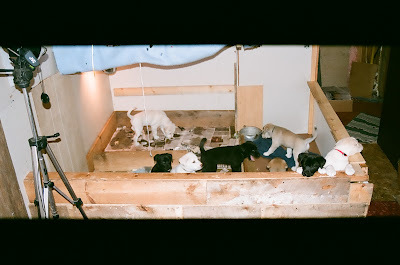 Then when the pups were three days old, I watched Fiona the white runt, fight with all of the determination and soul to get to the "feed bag" after her siblings. My heart did flip flops and I decided right then and there, she was a keeper. After many days of see-sawing with whether to keep the black female who had stolen my heart in so many ways, I finally had to come to the realization that having three puppies at the same time was probably not the wisest choice, black or not and I laid her in the hands of a dear friend where she found the home she needed. And while it was the hardest decision I made giving up my little black Angel, my dreams for a black dog haven't died. My ultimate dog is an all black Husky mix with blue eyes. I have never had a blue eyed dog and actually not sure if I care for the color, but I think the contrast between the black and blue would be awesome! Yep, it was all because of me!! So have I based any decisions based on color? On the overall no because I didn't chose any one those first three dogs or my cat, they were given to me. It's no secret that I have always had an attraction to black animals and when I chose Brut, I definitely did not choose him for his color but he put a spin in my black dog vision and turned it completely upside down. Or is that right side up?? :) Whatever it was, it was I have come to appreciate the variety and beauty of all of them. So tell me, how much did color influence your decision in choosing your dog? Or was there something else that drew you to them first? Have your opinions changed over time or do you tend to stick with your favorite colors? Did a particular dog or dogs come along that gave you a completely different perspective? Did you choose a specific breed for their color? 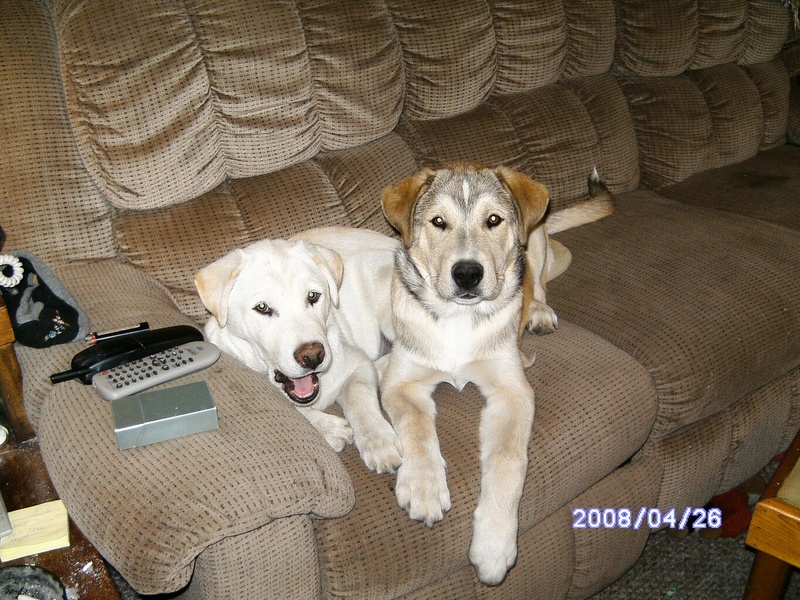 Brut and Fiona have this awesome relationship that started when Fiona was young. They have a proper pack relationship. Fiona automatically submits to Brut. 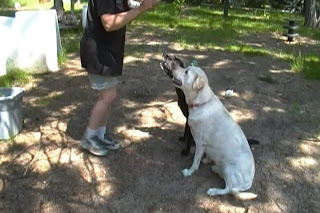 When Brut corrects Fiona, it is usually only for a few seconds and then they are off play bowing and chasing each other. She keeps her head and tail lower than him, staying close to the ground if needing to submit immediately. To me it is completely fascinating, as the only other time I have seen this hierarchy in action is during documentaries about wolves. When there isn't an friction between them, they are basically equal and I have witnessed Brut give in to Fiona many times. Fiona is amazing in her speed and wit and can usually outsmart Brut with a single move, but when Brut calls rank, she is down. No questions, no challenge, no nothing. Consider me an equal opportunist but I've have never completely understood the purpose of the lower ranked dogs. They are always cowering and look like they've been beaten, but somehow I understand in witnessing this respectful relationship between Fiona and Brut how powerful it can really be. I have always wanted to record a full blown account of this Alpha-Omega in action, but this was the closest I could find. In this video from last fall, you can see in the beginning as Fiona meets Brut at his level, then her head starts to drop, then her tail, until she is sitting. It is like bowing with the ultimate respect and having it returned. That is the part that blows me away. Brut and Fiona's relationship is the most direct form of the Alpha-Omega relationship that I have witness between the four Back Dogs and I find myself in a bit of awe about it. How about you? For those of you with more than one dog do you see this same dominance-submission traits in your pack? No one is getting by us!! Feeling like Granny in her rocking chair, on the front porch, shotgun in hand, as the Front Dogs and I are protecting the property and each other. OK, it may be a lawn chair, on a cement slab, minus the shotgun, but the rest is all true. There is a rental unit next door to us and every summer there's at least one or two groups of college kids that come to party. While I have nothing against either, it's a little different when they are next to your home. I have never had any problems, but tonight as the gang pulled in, there were a couple of guys messing with Chance and Blaze. Well, if there is one thing I have learned throughout my time in the dog world, not everyone likes dogs, and many can be mean and cruel or deadly. So I keep a close lookout on the Chance and Blaze. These are times I am extremely grateful they are such superb watch dogs. They are excellent at giving off a warning and letting me know when someone is out there. I appreciate the job they do. All they do is bark. That is it. They are not attack dogs. They just like to sound the alarm. All I had to do was walk outside and the boys scattered. Messing with my dogs is one thing I won't tolerate from anyone, I don't care who they are. The warning signals aren't limited to just anyone in the rental unit and there are times during the day I can get a little aggravated at having to run to the front yard to see what all of the fuss is about, but I realize in situations like these, it is well worth it. Not just for my protection but for the dogs as well. It helps us work together as a team and is one of those, "I'll watch your back if you watch mine." I liked that idea. I know many would disagree with this, but it is worth the protection that we have for each other and that's security I can live with. To the girl who had the pants scared off her when Chance suddenly jumped up and gave a one deep bark while I sat there laughing, I am truly sorry. I am terribly sorry that I can't stop giggling about it now, as I replay how Chance was sitting calmly at my feet and in a split second pounced at the corner of the fence. And I suppose I deserve that dirty look you shot at me when the shock wore off and I was still laughing, but it had surprised me as much as it did you. In my defense, you've walked by our fence numerous times and know there is a big white dog who seems to get a kick out of letting you know he is there. No different than any other day. Teaching Blaze to leash walk has presented many challenges for me and has been completely different than training Chance. Being that she was one of our pups that was returned abused, I find that working with her, I am extremely sensitive to this fact. I find myself flowing with a sense of guilt about what has happened to her and find I am easy on her in our training. While I don't let things slide, pulling for example, but I finding myself compromising training so that we can just walk. I have never forgotten those days when she came back home. I will never be able to shake those images and feelings from my mind, nor the guilt I still feel about letting her go. While she has come along way since those first days, I have always had an extra soft spot for her, regardless of how much she may aggravate me when she is in hyper drive. I suppose that this sensitivity to her could be seen as letting her get her way, but I found that I was asking too much of myself to expect to "train" her like I did with Chance and realized if I can't do it, I can't expect her to. So I had to let go and let us find our way together. We have been too far out of sync with each other when it comes to our walks that we needed to find a simple answer that works for both of us. So we are learning to walk together with a few basic training steps. Any other advancements will come in time. I have went far too long not being able to walk her at all and so this is an actual relief. While I am still a little uncomfortable using the no pull head halter, (another part of my guilt) it is letting us walk together and have that bonding time we have been missing without the added frustration. It took several months of working with her for me to I realized that not only did she need to learn in her own way but I still have my own guilt to settle within me. This revelation has been a blessing in disguise. I can not tell you how nervous I have been trying to leash train her, finding it so hard to relax and be comfortable with her. I have been so frustrated before walking Blaze as we have done a lot of head butting in past, but as I take these simple steps of walking, we are beginning to come together to a higher level of respect and understanding between us. Blaze is helping me by letting me follow her lead and in return she is following mine. Simple trust for the joy of a walk. Can someone fill my pool?? Stay cool by heading to the Blog Hop. 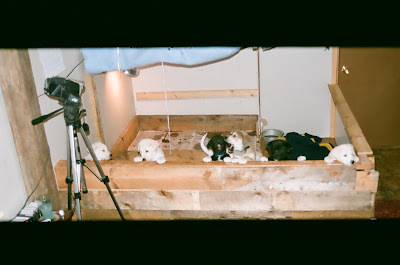 There is a foster dog named Oreo, on Corbin's blog that for some reason has touched my heart. I don't know if it is the name or the jet black fur or if I just see something special about her on my computer screen. I was almost sad to see that she had found a new furever home. If I wasn't tapped out in my own home, I might have scooped her up. Something didn't work out and she came back to stay with Corbin. While I was glad she was safe, I found myself wondering, what is Oreo thinking about the situation? Wanted and unwanted. An all too familiar cycle in fosters dogs. When I saw that Oreo was back, it truly broke my heart. Oreo isn't the only story I've read, there are plenty of others and they too have had me wondering the same thing. How do dogs feel being bounced back and forth between people and homes? What do they think about shifting from place to place? How do they handle being loved, wanted and needed and then not. Turned off like a switch. And for some foster dogs it happens countless times. Over and over. Do you think they ever give up hope? Yes, I could easily rant about people that return adopted dogs at their convenience and those that are not willing to take on the responsibility of owning a dog, but the question burning in my mind is... What do dogs think about being "returnable?" For all of our friends that are melting this summer, grab a cold one and kick your feet up. Cool Paw Chance is on the loose and he's gone splashing mad!! Everyone ready for the group shot? Ten puppies. I need ten puppies. Fiona...we can't see your pretty little face from behind Rocket. There we are. The Power of Ten! OK, admit it. You've thought about too. You're hungry, looking for something to munch on and you keep eying your dog's cookie jar. All those delectable goodies that you can pop right in your mouth. Now bust over to the Blog Hop hosted by Life with Dogs, The Two Cavaliers, and Confessions of the Plume. I grew up learning dominance training for dogs. I could never stand the constrain of it, even though I used it in my adult life. Silver got the brunt of it and it wasn't until getting Brut that I felt even more constricted by conventional training and the need to be free. I have read maybe three books on dog training and never read any of them in full. I found positive reinforcement and that helped to loosen up the grip but I still found it lacking in creativity. I began experimenting with several methods, a mixed bag of things I'd picked up along the way and my own intuition. I constantly changed and used what I needed at the time or what worked taking things to the next level. I learned to work within my own pace and the dogs, letting them guide me to where they wanted to go. I made mental notes along the way for my brain to process and when situations presented themselves, the idea was suddenly there. I followed the dogs lead many times (oops! that's not the right way) and found I had a better outcome than I when I tried to take the reins. I thrive on creativity and began to shape and mold the tidbits of information I discovered along the to work for me. I found that for me something will only work if it is built for both the dogs and I. If I'm not comfortable with it, then I can not expect my dogs to be. Over the past several years our lives have been sculpting into this beautiful bond that exist between our dogs and us and we have realized along the way that the journey is almost as good as the results. 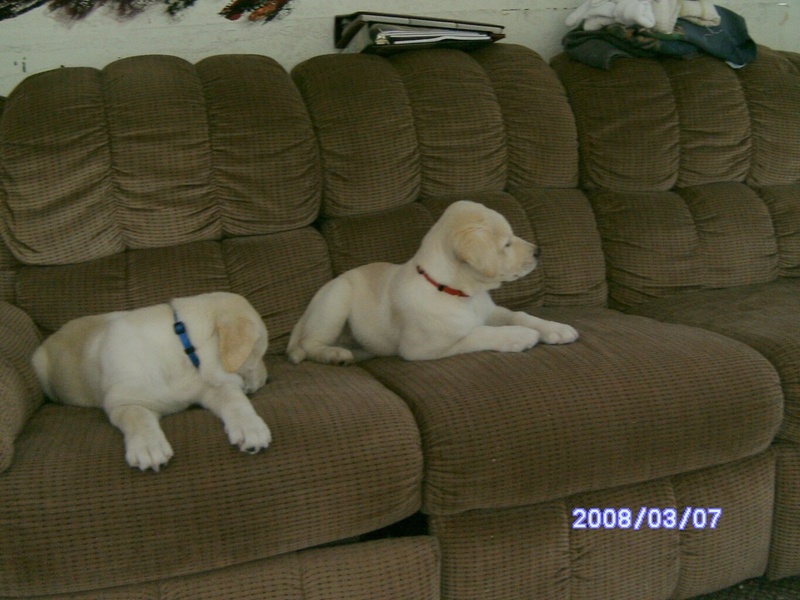 Like any parent who wants different for their children, I wanted different for my dogs than how I grew up. I wanted them to have the freedom to express and think for themselves (gee, how did we end up with Huskies??) and I wanted their personalities to shine, not be stuffed in a box or made to conform. I wanted them to live and experience life to it's fullest and not be tied down to rules and regulation. Has it been easy? No, and sometimes it is harder than hell. And as much as I believe in it, I still struggle within myself the acceptance of being able to do that. I have beat myself up because my dogs aren't like the other dogs or can't do the same things. They don't always have the best manners and they have special circumstances that make them outcast compared to other dogs and people I know. Sometimes I am embarrassed and ashamed and will go through periods where I try to "fix them," only to find myself swallowed in guilt, begging their forgiveness, and looking in those soulful eyes asking myself, "what am I doing?" Then I take a deep breath and bow again to these souls that lift me higher than I should be, reminding me of the reason I started this road. For these are my own inner struggles to be myself. I recently discovered that the gift I have been giving them is being returned to me ten fold. My dogs are teaching me how to have the freedom and beauty to be myself. For far too long I have wanted the perfect dog, but my belief in letting them be themselves overrides that want and holds a richness that inspires me to hold myself to the same principles. A feat still in progress and a journey that we are taking together. Yeah, we were clean, for about 5 seconds! What does she expect with a dirt yard and the fact that we are DOGS?? Now lets all take a dirt roll over to the Blog Hop! Thanks to our host Life with Dogs, The Two Cavaliers, and Confessions of the Plume. As I was hand feeding Fiona today, I started thinking that ten years from now I this may become a regular thing with this Ms. Fussy and was washed over with the wonderful thought of us growing older together. And the beautiful gifts that will come from sharing our lives in concert with each other dancing through time. 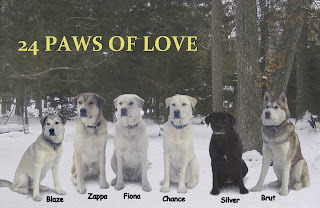 We are doing our first product review on Terra Paws- All Natural Freeze Dried Treats and the 24 Paws of Love, loved them. Simple. Beef, Chicken and Sweet Potato. You can't beat that. The treats were light and had a hard foam like texture. They did break easy, but that just made more treats for everyone. So you want some proof that the dogs like them? The real test was Blaze, my picky eater and she ate them right up. When I ran out of samples and was still doing tricks with the dogs, they would have nothing to do with their regular treats and keep sniffing and trying to grab the Terra Paw bags. Yep, I'd say they were hooked. 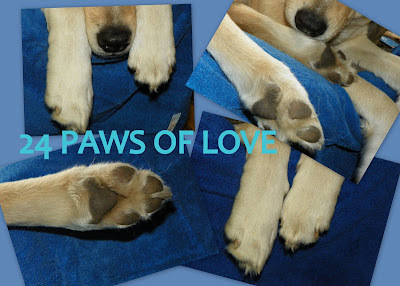 All of our readers that place an order during the month July at http://www.terrapaws.com/ can enter the promo code BL20 at checkout and receive 20% off their order. Terra Paws will have new products coming for this Summer. New, smaller pouches with one ingredient, such as: Turkey, Chicken, Sweet Potato, Beef Liver and Chicken Liver. All in all we were very please with the product and we are always up for trying new treats outs. Most importantly the dogs loved them and really that's all that matters. Don't you just love when your dog senses your needs without you asking for them to be met. Those times they know before you do and are by your side at that precise moment only for you to realize they were just what you needed right then. Those times when they seem to understand more than you can comprehend of how you are feeling and are there for comfort. Aren't those some of the most precious times? What about when it happens the other way around? There are always times I don't feel I measure up to being a dog mom. I have my faults and flaws just like anyone else and for so many years, all I ever saw was what dogs (and other animals) have given me. When I realized through the death of one of my cats that I was giving to them as well. They may be simple things, they may be huge, but absorbing their need for me is an on going awakening. I'm talking about more than food and water, I'm talking that they need me to help them through life as much as I need them and what an amazing journey this two way street is between us. I have always known that animals have helped me survive in so many different ways, but what I am still learning is how they help me survive not just because of my need for them, but of their need for me. That is powerful. I have been through some tough times in my life and have always known animals were there for me but what I didn't realize was I was there for them too. While I will constantly be amazed by the bond, communication and connection that exist, knowing that I mean something more to them than a meal ticket gives my life a value I am only beginning to comprehend. This value has given me an equality that I do not find anywhere else and I hold to preciously when the storms come. Well here is Red* and Blue*, but where is "white?" We have been very blessed that such wonderful people that take the time to read our blog and to received not one but two awards from several different people...we find ourselves a little speechless. Thanks to Pamela from Something Wagging This Way Comes, Kol's Notes and I Still Want More Puppies for this wonderful award. Thanks to Jet's Furkid Palace, Arwen's Pack and Greyhounds CAN Sit for this great award. Since I am a bit overwhelmed by the generosity of this dog community, I am going to skip sharing about ourselves and spread the love. 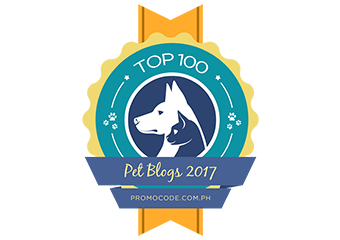 We have been exploring more into our dog/animal blog world and have discovered some blogs that are new to us and would like to pass these wonderful awards forward. While we don't know much about them, they all caught our attention in some way or another. Some you may already know and some may be new to you, but we believe they are all worth having a look at. We even threw in a few cat blogs to shake up the mix! So go ahead, take a minute and check out a blog you haven't heard of. You'll be glad you did. 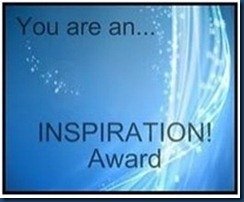 Thank you again for these wonderful awards, because it is really YOU, the readers who makes this blog what it is. Do you want some fries with that?? Thanks to Life with Dogs, The Two Cavaliers and Confessions of the Plume for hosting the Saturday blog hop. And a big smile for all of you!